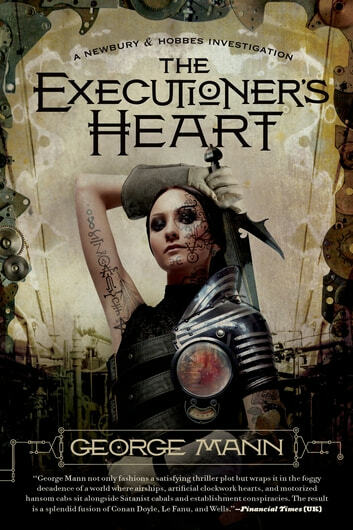 In *Executioner's Heart--*the fourth Newbury & Hobbes steampunk mystery from George Mann--the detectives are up against the most frightening villainess England has yet seen. It's normal for Charles Bainbridge, Chief Inspector of Scotland Yard, to be called to the scene of a crime, but this is the third murder in quick succession where the victim's chest has been cracked open and their heart torn out. Bainbridge suspects there's a symbolic reason for the stolen hearts, so he sends for supernatural specialist Sir Maurice Newbury and his determined assistant, Miss Veronica Hobbes. Unfortunately, neither of them are in much shape to take the case. Veronica has been hunting for some way to alleviate the mysterious forces that have been hounding her family of late, and Newbury has been retained by a private client: Edward, Prince of Wales, who's concerned that his mother, the Queen of England, is losing her grip on the nation. However, the two detectives pull together long enough to determine that the killings may be the work of a mercenary known as the Executioner. French, uncannily beautiful, her flesh covered in tattoos and inlaid with precious metals, the Executioner is famed throughout Europe, with legends going back for hundreds of years. Something is keeping her in a form of living stasis, but her heart is damaged, leaving her an emotionless shell, inexplicably driven to collect her victims' hearts as trophies. Who is the Executioner targeting, and who hired her? Why has Veronica stopped trusting Bainbridge? What does the Prince of Wales really want? These are just some of the mysteries that Newbury and Hobbes will confront on the way to unearthing the secret of the Executioner's Heart.